The blood vessels in the dermis provide nourishment and remove waste from its own cells and from the stratum basale of the epidermis. The epidermis contains no blood vessels, and cells in the deepest layers are nourished by diffusion from blood capillaries present in the upper layers of the dermis. The papillary region of the dermis is composed of loose areolar connective tissue. This is named for its fingerlike projections called papillae, that extend toward the epidermis and contain terminal networks of blood capillaries. The control of blood vessels within the dermis forms a key part of the body’s thermoregulatory capacity. papillary region: The uppermost region of the dermis that is adjacent to the epidermis. reticular region: The lower region of the dermis. The epidermis does not contain blood vessels; instead, cells in the deepest layers are nourished by diffusion from blood capillaries that are present in the upper layers of the dermis. Diffusion provides nourishment and waste removal from the cells of the dermis, as well as for the cells of the epidermis. The dermis: The distribution of the blood vessels in the skin of the sole of the foot. Corium—labeled at upper right—is an alternate term for dermis. 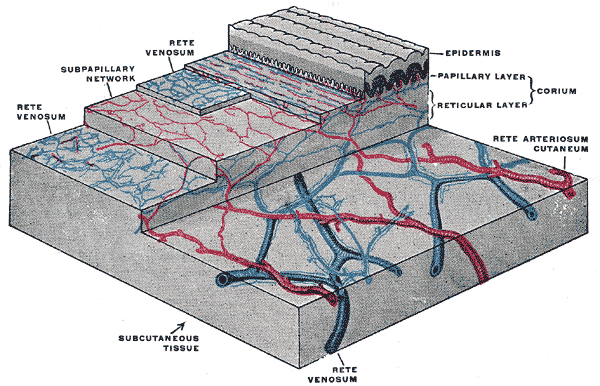 Blood vessels that supply the capillaries of the papillary region are seen running through the reticular layer. The dermis is structurally divided into two areas: a superficial area adjacent to the epidermis, called the papillary region, and a deep, thicker area known as the reticular region. The papillary region is composed of loose areolar connective tissue. This is named for its fingerlike projections called papillae, that extend toward the epidermis and contain terminal networks of blood capillaries. The reticular region lies under the papillary region and is usually much thicker. It is composed of dense, irregular connective tissue. The reticular region receives its name from the dense concentration of collagenous, elastic, and reticular fibers that weave throughout it. These protein fibers give the dermis its typical properties of strength, extensibility, and elasticity. Blood vessels that supply the capillaries of the papillary region run through the reticular region. Control of the blood supply to the dermis forms part of the body’s thermoregulatory capacity. Increasing blood flow, which makes the skin appear redder, will increase the loss of radiant heat through the skin, whereas constricting blood flow, making the skin appear paler, reduces heat loss.